Mathematics professor Chaim Goodman-Strauss’ earliest memories are laced with a fascination with patterns. 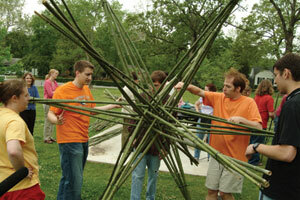 Goodman-Strauss and others assemble a structure made out of bamboo poles at Bamboopalooza, an event he created to generate interest in the shape of things. Stones in streams, designs on walls, lines on sidewalks, leaves on grass – he found himself drawn to these things not only for their visual beauty, but because they made him wonder. He wondered how patterns form, how tree branches grow in a certain way, and how leaves grow in certain shapes. As a teenager, he heard a lecture on the mathematician Georg Cantor, who gave a simple, clear way to compare the sizes of infinite sets: some infinities are the same, but some are larger than others. Amazingly, the size of the set of counting numbers is the same as the size of all fractions, because there is a one-for-one correspondence between counting numbers and fractions. Even more amazingly, though, Cantor showed the set of real numbers is vastly larger than either the set of counting numbers or fractions. For Goodman-Strauss, this lecture multiplied his interest in the intersection of logic and geometry – mathematics — and added up to a future career. “I was already doomed to be a mathematician, but that lecture sealed my fate,” he said. Today, Goodman-Strauss finds himself drawn to paradoxes. Take the statement: “This sentence is false.” A moment’s thought shows the statement can be neither true nor false: either option would lead to a contradiction. Such paradoxes also exist in mathematics. In 1931, Kurt Godel, one of the greatest logicians of the 20th century, proved that any set of mathematical rules is either incomplete, in the sense that they miss important truths, or inconsistent, in the sense that they contain a contradiction. He studies topology, or the mathematical description of structure. Topologists study the properties of geometrical structures, including connections between them. Consider, for instance, a New York subway map. The map does not tell you how far it is from central Manhattan to the Bronx, or whether one station is north or south of another, but it does show you how the stations connect to one another. “Topology can describe everything from the chaos in weather to the development of a baby’s ear,” Goodman-Strauss said. Topologists study spatial objects, including curves, surfaces and even the space we call the universe. Humor aside, the strength and weakness of mathematics, Goodman-Strauss believes, is that it creates new ways of thinking about things. This can lead to important insights, or it can lead to abstractions that have little to do with the real world. “It can be difficult even for scientists to appreciate where mathematicians live,” he said. One glance around Goodman-Strauss’ office offers an eyeful of how he lives. His walls sport posters filled with colorful geometric tilings. His shelves hold books, but also three-dimensional shapes in wood, paper and other media. The office window is covered in paper snowflakes. The ceiling sports images of spherical repeating patterns, some of which will be featured in a book about symmetry that he is writing with John H. Conway of Princeton University. Shapes composed of balls and sticks perch on filing cabinets. He reaches up to the top of one of the filing cabinets and pulls down a wooden object with an unusual shape – almost conical, yet spherical as well. It is a representation of hyperbolic geometry. “You can look inside your refrigerator and find a piece of hyperbolic space,” he said. The next time you make a salad, pull the leaf lettuce out of the vegetable crisper. The wrinkled, crinkly leaf lettuce has lots of area in a small space. “Anything that’s super frilly has the same geometry as the hyperbolic plane,” he said. 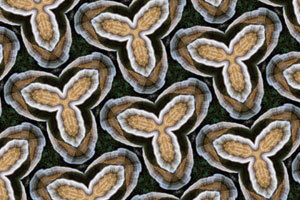 Goodman-Strauss is curious about the way living things take form. He continually finds himself fascinated by the structure of trees and the patterns the branches follow as they grow. He points out that while biology and mathematics have made great inroads at the molecular and ecological level, little is known about the geometry and form of living things or why living things take on the shapes they have. Which may explain why Goodman-Strauss ended up using his grandmother’s crocheted fruits and vegetables during a mathematics research lecture at Brigham Young University last year. In crocheting, a person uses different numbers and types of stitches to create shapes. You can see the stitch patterns in the colorful creations that Goodman-Strauss has piled up on his table – strawberries, carrots, pineapple and cauliflower. They offer a mathematical model for explaining the challenging concepts of how shapes take the form that they do. Using a visual aid enhances his teaching, which informs his research – and vice versa. Many people shy away from mathematics, but math continues to be important in everyday life, Goodman-Strauss said. People use math to assess risks, invest for the future, count calories, and decide on the better bargain when they make decisions. Often, people’s aversion to math has to do with the way they learn it. “When people come out of high school, they know the techniques, but they often don’t know what the math means,” Goodman-Strauss said. Scale, rates, statistics, probabilities and risk factor into decisions people make every day. Yet people often don’t realize that basic math can help them make better-informed decisions. “We’re always making calculations and judgments about things,” Goodman-Strauss said. One needs only to pick up a newspaper to see examples. Medical studies on diet, the federal budget, the national debt, the gross domestic product, Social Security – all of these involve mathematics, and all of them impact the everyday lives of people, yet people often have no concept of how to interpret the data they see. To help address these issues, the mathematics department has developed a set of innovative finite math sections, and Goodman-Strauss is teaching one of those sections. One day he used the nuclear arsenal of the United States as an example to explain scale to his students and to emphasize the message that mathematics matters. A few simple calculations that add the zeros on the end and multiplying by two to approximate the conversion from tons to pounds tells you that a one-megaton bomb contains about the equivalent of 2 billion pounds of dynamite. The U.S. arsenal has about 10,000 bombs. “It’s not a bad guess that they’re about one megaton on average” said Goodman-Strauss. If the world population is about 6 billion people, that means the U.S. arsenal contains the equivalent of about 3,000 pounds of dynamite for every person on Earth. “That is an astonishing use of numbers!” Goodman-Strauss said. In addition to bringing pertinent information about mathematics into the classroom, Goodman-Strauss has taken mathematics outside the classroom. He coaches bright students for the Putnam Exam, a mathematics exam given annually that stymies all but the nation’s brightest mathematical minds. He serves as adviser for the math club. And recently he created a Math Problem of the Week series that runs on Ozarks at Large, the local news program on National Public Radio, KUAF 91.3 FM, at 9:30 a.m. Sundays. This year, he is sponsoring the second Bamboopalooza, an event where people will use bamboo poles to create a giant geometric shape. That mathematical world fascinates Goodman-Strauss, and he spends lots of time navigating a particular area of geometry called tiling. 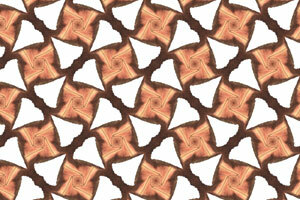 He studies the complex behavior of repeating shapes and how they fit together. The shapes could represent bits of computer code, mathematical equations or molecules. In particular, he studies “aperiodic” tiles; you can fit copies of aperiodic tiles together to make a tiling, but only in non-repeating patterns (see illustration on page 14). For example, black and white squares are not aperiodic: you can fit together black and white squares to make a non-repeating pattern, but you also can fit them together to make a repeating pattern. 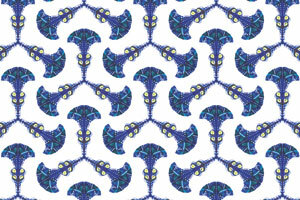 Aperiodic tiles can only make non-repeating patterns. Mathematicians have only been aware of such tiles since the 1960s, and only a handful of such patterns had been discovered up to the mid-1990s. “There was no rhyme or reason to why they worked,” said Goodman-Strauss. 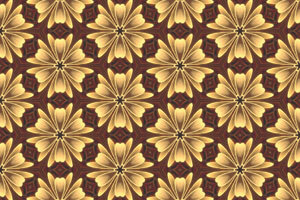 But in 1995, Goodman-Strauss created a very general method for creating new aperiodic tiles. Before this, only a dozen examples were known; his method gave infinitely many. The technique even works in every higher dimension. A renowned mathematician of the early 20th century, Alan Turing, proved that there are certain mathematical questions for which there can be no general method of answering. The Halting Problem is the most famous example: there is no general procedure to decide whether a given computer program will or will not halt after a finite number of steps. The question is undecidable. Certain tiling problems are also undecidable, such as the Domino Problem, which asks if given a set of tiles, can you decide if they can tile the entire plane at all. Goodman-Strauss used the Domino Problem in the first proof of an aperiodic set of tiles in the hyperbolic plane – work that was supported by the National Science Foundation and appeared in the prestigious journal Inventiones Mathematicae. Goodman-Strauss continues to contemplate these and other mathematical problems.